Since 1825 lighthouses on Garden and Loggerhead Keys in the Dry Tortugas have warned mariners to keep clear of nearby dangerous reefs, flats, and rocky shoals. The first light tower, 70 feet tall, was located on then barren Garden Key. After construction of Fort Jefferson was under way in 1846, the Lighthouse Board decided the tower was too short to provide adequate warning and proposed that a new lighthouse be built atop the wall of the fort. The new light consisted of a boilerplate iron tower with balcony and parapet. The lens from the old tower was installed in the new one and first lighted on April 5, 1876. In the meantime, construction of a new 150-foot tall lighthouse was begun on Loggerhead Key, three miles west of the fort. The walls were brick, made in Pensacola, and 203 stairs made of cut granite. The watchroom and lantern were constructed of iron and copper. The walls were 3 feet 9 inches thick at the base and tapered to 2 feet 9 inches at the top. Outside diameter tapered from 28 feet at the base to 13 feet at the top. Two hurricanes -- one in October of 1873 and another in September, 1875 -- seriously damaged both lighthouses. 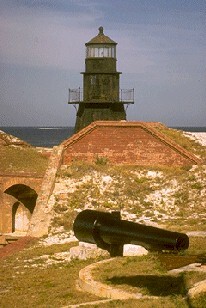 The Loggerhead Key light was regarded as being so essential, Congress Immediately appropriated the needed funds for its rebuilding, Funds also were made available for restoring the light on Garden Key. Loggerhead Key light was originally equipped with a 1st order Fresnel lens. it cost $10,000 in 1958 and was made of hundreds of precisely ground glass prisms. The fixed white light was designed to be visible for 20 miles on a clear night, Panels of red glass were added in 1893 so from dangerous shoals the light appeared red. In 1909 the Fresnel lens was replaced with a revolving 2nd order bivalve (clamshell) ground glass lens. It was turned by a clock-like mechanism powered by a weight suspended from a cable runnIng through the central brick column that needed to be rewound every 16 hours. This light was observed from a possible record distance of 53.6 miles in 1934. In 1986 this lens was replaced by an electric 24-inch aero type beacon powered by generators. If the main light falls two battery-powered emergency lights come on automatically. After more than 130 years of continuous service, the Loggerhead Key light remains an active aid to navigation under the control of the National Park Service. Partially excepted from a brochure researched and designed by Lt. Neal K. Marthon Key USCG.